Skat provided training of regional water advisors, of NOG’s and in particular of WaterAid and staff on the use of the Technology Applicability Framework (TAF). Skat supported WaterAid in the practical application of the TAF in several case studies (e.g. solar powered scheme in Singida District, household latrine in Iramba District). The process for rolling out of the TAF in the sector was supported through developing policy briefs and inputs for the web-based Project Implementation Manual (PIM). Tanzania is progressing towards its goals for providing safe water and adequate sanitation services to its people. However many infrastructures and systems established in the past do not provide the level of service intended or do not work at all. Lack of participatory planning, unclear structures for operation and maintenance or poor technology choices are among the reasons for poor performance. Under the lead of the Ministry of Water WaterAid informed the WASH sector on the potential of the TAF to become a relevant tool for strengthening participatory planning processes of WASH services in an early stage of planning. Skat supported WaterAid and the sector to fully understand sustainability issues of WASH services and linkages to technology introduction, the concept and use of the TAF, and of its potential role in the further implementation of the national Water and Sanitation Development Plan (WSDP). 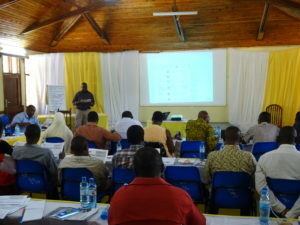 Tranier of trainers were selected to further train more WASH actors involved in the planning of WASH services.